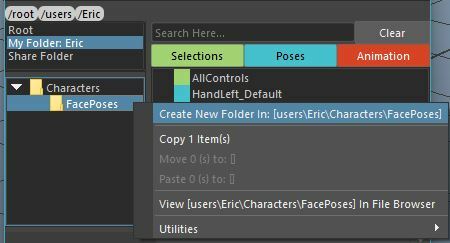 Make sure to create a folder on your computer or network for storing and sharing your poses, selections and animations. Enter this path into the “rootPath” variable. * Set your root path, this is where all the animation data will be store. * Hint, use a network folder so everyone on the team can share! Select your controls in the scene. Click “Create” and select what type of item you want to make. Create folders by right clicking on the left panel. Organize your stuff however you like. There are 3 main sections in the UI. In a production environment, artist will be using referenced rigs. This top list will show all of the namespaces in the scene. When you have a namespace(s) selected in this list, it will apply the selection, pose or animation to the characters under these namespaces. For example, if you make a hand pose on CharacterA, you can easily apply this pose to CharacterB by simply selecting it in the namespace list before applying the pose. The folders on the left represent actual folders on your computer or network. Bookmarks for your “My Folder”, or for the “Share Folder”. The folder structure is really open ended and you can organize this how you would like. Create subfolders for just face poses, or use groups to seperate poses and animations. Its up to you! The right side will display Selections, Poses and Animations. * There are quite a few right click menus, so its a good idea to right click and check out the menus. More documentation will come for these features. Depending on what type of item you click on, this section will display different options. Add descriptions to Poses and Animations, as well as track versions. Use the green range slider to visually set the in/outs. Looks like another interesting tool! Where does one get this ‘ebLabs_SusanAnimManager.py’ ? Currently the beta is only available to a small number of testers. This is getting quite close to release, thanks for your interest! Any update on this one please? Thanks for reaching out! Yes, the Animation Manager is complete and being used on some productions. Ive actually started an entirely new version, that will be even better! Hope to have more news on this in the new year!